This building is now unfortunately demolished along with a lot of the places of entertainment in the village. I spent many happy hours there and it was a focal point as we became teenagers, especially during the winter nights. I have to finish now as something has come up so I will return the subject of this building as soon as I get time. There was a lot of snow in Ushaw Moor during the period January to March 1947 and Brian M [Noodles] made reference to it in an earlier article. The Moor also suffered a severe gale in early February 1948 with 95 miles per hour winds recorded in Durham city. No doubt Sleetburn got it as well! There was heavy snow for much of early March 1958. Seven years and a bit later there was again tons of it [November 65]. March 79 brought a snowstorm and 1985 brought lots of snow during the Christmas festive period. Were you born during any of those periods? Or married? Or on holiday elsewhere? Most of the information was derived from family records with a bit from the Ferryhill weather records. It is very rare today especially living in a conurbation as I do to hear the natural sounds of nature as there is always a background noise of some description. One sound comes instantly to my mind in that category. There is a small pine wood at the Broadgate crossroads and that is where the sound originated. I love to hear the sound of wind in trees at any time. The sound of the wind blowing through the pine trees produced a unique sound which I think is described as the wind soughing through the trees. When you walked through the wood you made very little noise because of the thick covering of pine needles which had accumalated over the years. On the opposite side of the road there was a seat and when out for a walk we would spend a few minutes having a bit crack about life in general.. When there was a lull in the conversation there would be the sound of the wind soughing gently through the pine branches. but the soughing never sounds the same from that small wood. Perhaps again there are too many background noises in that are what with industry on the North bank of the river and the Metro rattling along about a hundred yards away. It was not out of the ordinary on a Sunday afternoon to walk past Ushaw Moor Colliery, turn left down to Broadgate and up the road to Ragpath. Follow the track to Esh Winning then turn left and walk up to Stand Alone Wood. On the way up to Stand Alone you followed the old Roman road Deare Steet for a short distance. Turn left and walk to Pit House Colliery and cut through the Pit Yard and follow the track down the Church Fields to Eshwood Street at the bottom of New Brancepeth. Cut through the Pit Yard at New Brancepeth and join the road to Ushaw Moor and so home for Sunday tea. I always enjoyed my Sunday tea ( home baked pies and tarts etc). I hope the spelling is OK as the text seems to have gone awry in the Text box. I am going to attempt to enter the families I can remember living in Victoria Court about the year 1950. I would like to people to read the article and put my mistakes right and update it if possible where I have falled down. No. 1. Mr & Mrs Ellis and their family Billy, Ernie and Elsie. They moved from Ushaw Moor Colliery. No. 2. Mr & Mrs Illingworth and their son Gordon and I also think a girl lived at home. They moved from Ushaw Moor Colliery. No. 3. Mr & Mrs Hodgson and their two daughters Sheila and Mary. Their grandma lived with them but I never knew her name. They moved from Ushaw Moor Colliery. No. 4. Mr & Mrs John Harrison and their family Mary, Winnie Tommy and Helen. They moved from New Brancepeth. No 5. Mr & Mrs John William Alderton and their family Peter, John, Colin, Fred and Barbara. They moved from Alum Waters. No.6 Mr & Mrs Carse and their family twins John and Derek and their sister Dorothy. Mr Carse was the Clerk of the Works for the Estate on which we lived. They moved from the Mill down at Alum Waters. No. 7. Mr & Mrs Amos Mortlock and their two daughters Dorothy and I cannot remember the name of the other daughter. They moved from Ushaw Moor Colliery. No. 8. Mr & Mrs Tose and their grown up family. I cannot remember their names. I believe they moved from Eshawwod Street at New Brancepeth. No. 9. Mr & Mrs Morgan, and their family John and his sister whose name was I think Doreen. I remember John like all young men in those days was consripted into the Army for two years with the Durham Light Infantry and served in the Korean War. They moved from one of the two long demolished houses adjacent to Osbornes farm at Broadgate. No. 10. Mr & Mrs Fred Stewart and their family Fred, Doreen and Eddie. They moved from Ushaw Moor Colliery. No. 11. Mr & Mrs Temple and their son Arthur. They moved from Ushaw Moor Colliery. No 12. Mr & Mrs Gillon and their family Gordon, Dennis, Owen and Malcolm. They moved from Pringle Place at New Brancepeth. No. 14. Mr & Mrs Snaith and the twins Arthur and Albert, and Ken. They moved from Ushaw Moor Colliery. No. 15. Mr & Mrs Rowan and their family Maureen, Dennis and Patricia. They moved from Broompark. No. 16. Mr & Mrs Stout and their sons George and Robert and an older sister Jane. They moved from Broompark. No. 17. Mr & Mrs Scott and family. They moved from New Brancepeth. I think they lived down the Lowside. No. 18. Mr & Mrs French and their son Jimmy and daughter Marlene. Jimmy was a great footballer. They moved from Broompark. No. 19. Mr & Mrs Grey and their son Morris. They moved from Broompark. No. 20. Mr & Mrs Hope. They moved from Ushaw Moor Colliery. No. 21. Mr & Mrs Gott and their daughter Maureen and son Joe. They moved from New Brancepeth. No. 22. Mr & Mrs Maddocks (not quite sure of the spelling) and their daughter Shirley and sons John and I think David. They moved from Ushaw Moor Colliery. No. 23. Mr & Mrs Pearson and their son Robert (Dumper) . They moved from Ushaw Moor Colliery. Mr & Mrs Pearson and their lads Tucker, Raymond Albert and I am sure there was another younger son whose name slips my memory. I am not sure where they moved from but Temperance Terrace rings a bell. Mr & Mrs Smith and their daughter Mary. I think there was also older sons at home. They moved drom Pringle Place at New Brancepeth. No. 27. I cannot remember this families name or details. No. 28. Mr & Mrs Ackley and their son Dennis and daughter Maureen. 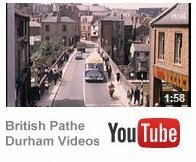 I am sure they moved from Jubilee Street at New Brancepeth. No. 28. Mr & Mrs Morland and their daughter Doris. They moved from New Brancepeth. No 29. I cannot remember the details of this family. No. 30. Mr & Mrs Wright and their son Lawrence. I think they moved from Ushaw Moor Colliery. No. 31. Mrs Gibbs and I can only remember Sarah but I think there were other family members lived. They moved from Eshwood or Church Street at New Brancepeth. No. 32. Mr & Mrs Howarth and their son Mickey and daughter Monica. I think there other family members living there but I cannot remember their names. They moved from Ushaw Moor Colliery. No. 33. Mr & Mrs Dickie Tolson and their son Robert. I know there were other family members but I cannot remember their names. They moved from New Brancepeth. Mr & Mrs Mawson and their son Harold. There were other family members but I cannor remember their details. They moved from Ushaw Moor Colliery. Mr & Mrs Griffiths. I cannot remember their family details. They moved from New Brancepeth. Mr & Mrs Halpin and their family Edgar, Philomenia, Mary and Joseph. They moved from Church Steet in New Brancepeth. No. 37. Mr & Mrs Peter Turnbull and their family Harry, Percy and Greta. I am sure they were other family members living at home. They moved from Ushaw Moor Colliery. No. 38. My Mother Mary and Dad Jimmy and my sister Mary and brothers Jim, Mick and Kevin. We moved from 29 Harvey Street in New Brancepeth. No. 39. Mr & Mrs Morland and their daughter Ann and son Malcolm and I am sure there was another brother. They moved from Pringle Place in New Brancepth. Came across this photo, wondered if anyone had any more info on it, date etc. You can now purchase a “hard copy” of the Ushaw Moor Memories BLOG. It is available as a soft back A5 book compiled into 300 pages with contents of TOPICS with comments. The cost is £18.00 +p/p. Noodles, also known as Brian Mcloughlin, is a fine writer and has come up trumps. Perhaps no one else fancied competing against his vivid and entertaining accounts of times gone by. His choice of books will need to be conveyed to me so that I can make arrangements to present him with his prizes in the autumn.